On the face of it, this combination of positions is contradictory; a logical mistake, of the same order as found in Kahneman and Tversky’s famous Laura experiment. It’s easiest to see this if we imagine a fourth question D which the survey didn’t put, asking about the impact “if everybody in the world took these same actions”. Now the answer to A and D should be the same. If I reduce my contribution to global warming – my carbon footprint – by 50%, and everybody else in the world reduces theirs by 50%, then the total contribution to global warming also falls by 50%. The answer to question C should be lower, because (a) it’s “most”, not all, and (b) only a fifth of the world’s people live in modern industrialised countries (say OECD members), while poor India and China are very large and growing carbon emitters. The answer to B should be lower again, because the USA population is only a quarter of the OECD’s. The C/B dominance was what was observed, and tends to confirm that respondents took the exercise seriously. Given the population data, the logically required hierarchy is A(=D) > C > B. The survey consistently found C > B > A, over six cycles. What is going on? Please help me out. 1. I have got the whole thing wrong and made some simple mistake in reasoning. Show me. 2. The respondents are dumb and incoherent. (a) If people are just saying the first thing that comes into their heads, the findings would not be consistent from year to year. (b) It’s bloody patronising. When looking at puzzling findings from professionally conducted surveys, we should try to construe them in the most economical and respectful way that makes sense, and only conclude that people are just being stupid as a last resort. 3. The fusion of the “some” and “a lot” categories distorts the chart. It does; but the disparity in those who said “a lot” is even wider, not narrower, so the paradox remains. 4. My thought experiment requires “everybody” and the questions said “most”. That should lower the “yes” response to B and C about equally, without changing the hierarchy or my thesis. 5. Respondents think there is a terrific amount of synergy. If you go from 1 person doing X (say putting a 3 kw solar panel on their roof) to 1 billion, the impact rises say 2 billion times. (b) if respondents thought so, the answer to C should be much higher than to B, as you quadruple the number of people. It’s possible of course that American respondents do seriously underestimate the size of the OECD population, which is 1.2 billion. 6. My question D and thought experiment are invalid, as a factory worker in China, a peasant in India or a slum-dweller in Brazil cannot take “the same actions” as an American. They have no air-conditioning to turn down, or gasoline SUV to trade in for a hybrid. Objection: the difficulty holds already for the other OECD people, who mostly don’t have air-conditioning and do have efficient cars; and even within the USA, with its huge regional variations. Wall insulation makes a big difference in North Dakota, not much in Florida. For the questionnaire to work at all, respondents have to interpret “the same actions” in a very elastic way; broadening from “wall insulation” to “making my house more energy-efficient”. The Indian peasant can do this by switching away from a wood fire or kerosene stove. Respondents were able to answer the question, so they must have made such mental adjustments. Kant’s categorical imperative universalizes rules of conduct, not single actions. 7. Respondents heard a different question to the one put. 7.1 They heard “contribution to the chance of dangerous global warming” not “contribution to global warming”. That introduces a binary, yes/no criterion. In this case, anybody’s personal contribution is insignificant. But that’s the objection too: insignificant, not 32% for “some or a lot”, by any stretch of the imagination. 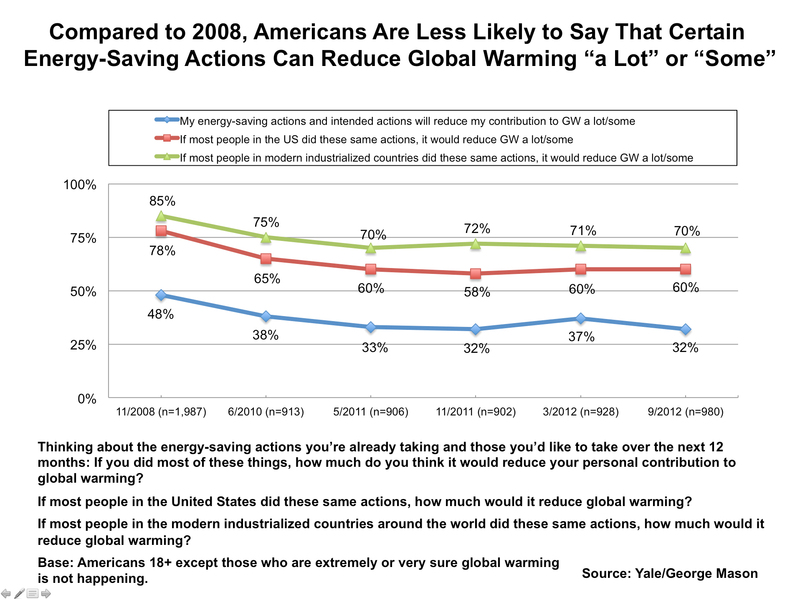 7.2 Respondents heard B and C as “if everybody in the USA/OECD did their bit….” and shifted the blame to spendthrift others. I’m doing my share and it’s not much, now you, the gas-guzzling private jet owner, do the heavy lifting. The extravagant are more likely to be among the 18% denialists, true, but it’s a huge stretch to think they plausibly account for the sort of differences observed in the responses. 7.3 A related and somewhat more complicated idea that doesn’t require distorsion is this. Go back to the framing of the survey. Respondents were asked about a string of steps they might take in their private lives (the survey-takers didn’t specify, but respondents would have thought of home, shopping, and commuting); but they were asked to relate it to their total carbon footprint. This includes carbon embodied in all the goods and services they consume, and in the physical investments funded by their saving and taxes. I made a modest effort at a methodology cribbed from Leontief to estimate these, though sadly I have to report that the world has not beaten a path to my door. At any rate, these indirect carbon footprints are large, even for apparently disembodied services like insurance and web search. They are also out of reach. 5% or so of global carbon emissions come from cement-making, and the same again from iron- and steel-making. What can a consumer do to affect this? Nothing. You can do a tiny bit to shift the behaviour of retailers and service companies like Google by consumer activism. The rest can only be affected through politics. The suggestion is that respondents correctly related their local steps to their overall carbon footprint, and concluded they couldn’t do that much as consumers. At work, most of us are powerless. But when they thought about whole societies, they dropped this constraint, and considered “everybody else” in all their social rÃ´les, including those as political and economic actors: managers, congressmen, CEOs, academics, pundits. In that case, the observed hierarchy of responses becomes perfectly sensible. If the USA as a society, including its Ã©lites, took carbon emissions seriously, it would make a significant difference to global warming. It matters that the likely next US Secretary of State, John Kerry, is a knowledgeable climate hawk and not an able climate ostrich like Susan Rice. Hypothesis 7.3 doesn’t require charging the respondents with unconscious falsification, so I think it’s preferable to 7.2. What do readers think? The downward trend in A is odd. Over these 6 years the practical options for citizens to take effective action have expanded, not shrunk. The cost of solar panels continued to fall; solar leasing has made them accessible without upfront investment; plug-in hybrid and fully electric cars have gone on sale from major manufacturers; LED lighting is in the shops everywhere; better labelling, smart meters, thermostats and software have created new options for managing home consumption; there are more green investment vehicles; internet shopping has reduced the need for shopping trips, and social media for face-to-face meetings; and so on. Whether it’s 7.2 or 7.3, either way the chart is depressing. It suggests that in this field Americans have given up on their self-belief – a national trait, often to excess – and are waiting for Godot. The preconditions for real change are hope and mobilisation: creating wide and deep pressure at a variety of levels, from individual example, persuasion, ridicule, ostracism, the ballot-box – and protest and civil disobedience. How about staged defiance of the ridiculous, kakfkaesque, uncoordinated multiple-permitting bureaucracy that drives up US residential solar costs to twice those of Germany, which does perfectly well without any prior permitting at all? You don’t need a permit to buy a gas cooker, which is far more dangerous. Let’s have more, and less polite, climate noise in 2013. The transition can be done. There is no try.